How do these people react during their maiden voyage with Tesla Autopilot? YouTuber and Tesla Model 3 owner model3man received some special requests. People asked him to film family members’ first impressions as they got behind the wheel and experienced Tesla Autopilot. He warns us that since you only get one chance to make a “first time” video, the camera work is not perfect. Nonetheless, it’s pretty interesting to see to the look on people’s faces and hear their comments when the Tesla is driving itself. model3man begins by trying out Tesla Autopilot himself and showing us how it works. Then, he puts three different family members in the driver’s seat to compare their reactions. The consensus is they aren’t sure if they can trust the car. This is a good thing. Remember, Autopilot is a Beta product and should never be trusted or relied upon. Instead, it should be used as a driving aid. With that being said, these drivers should have had their hands on the wheel at all times and been ready to react instantly. Have you tried Tesla Autopilot? What was your first impression? Let us know in the comment section below. How do you react when you feel your life is threatened? Perhaps a little like the reactions you’ll see in this upload – I was fortunate that my wife and daughters all agreed to let me video them during their FIRST EVER use of Autopilot in Red Dragon! Their terror, amazement, alarm make for interesting viewing and will perhaps help you when you or your family members first use it! Well, the more I thought about it, the more attractive it sounded. Now, you only get one shot at a “first time” video, so please forgive any bad camera angles or occasional annoying lighting. Top priority was simply getting the action as it happened. You’ll see how each of the three (Janine, Jillian and Philippa) react VERY differently, in line with their personalities. Anyway, it was a lot of fun to make and I hope it’s just as much fun to watch! 26 Comments on "Watch As First-Time Tesla Autopilot Users Are Terrified"
Autopilot is still a terrible name for the current product IMHO. People hear it an instantly think they are allowed to take their hands off the wheel. And by that ignoring all the info displayed in the manual and on the screen? Tesla makes it abundantly clear that it’s a “hands-on” technology and that it’s in Beta mode. While the name may be misleading to some, the automaker’s disclaimers are what’s most important. And yet dips like this YouTube moron are telling people to take their hands off the wheel. Folks like this idiot give Tesla a bad name. People will blame Elon when someone is killed due to his stupid behavior. I feel bad for the wife – she’s clearly trusting him even though she is terrified. What kind of man would force his wife to drive that way just to get some views? If she want’s to drive the car herself let her! Thank you! Many people are reluctant to give up control — it’s a psychological thing — so claim they will never use Autopilot+Autosteer. Telling the driver to actually take his/her hands off the wheel, when they are not used to giving control over to the car, is both dangerous and stupid, if not downright abusive. That is unfortunately true, but it seems Tesla is determined to keep the name. A German regulatory agency actually asked Tesla to change the name, but Tesla ignored them. Did I miss it, when did Elon Musk say to keep your hands off the wheel and your feet away from the pedals? Nope. As far as we know, he never said that. That’s why we put in the BOLD disclaimer. The YouTuber also gets called out on YouTube and responds to the complaints. You certainly didn’t miss it, MAF. This video infuriated me in the extreme. To put, obviously nervous, drivers behind the wheel and to coach them (against their better instincts) to behave in such a stupid and dangerous manner, is verging on insanity. I’ve lost track of the number of times Elon has reminded us that we MUST be in control of the car ourselves. This MORONIC FOOL would have had to agree to the warning message before he was even able to activate it in the first place. I wish InsideEVs wouldn’t post these videos promoting such potentially fatal behaviour – or at least have glaringly obviously warnings in the headlines! Actions speak louder than words. 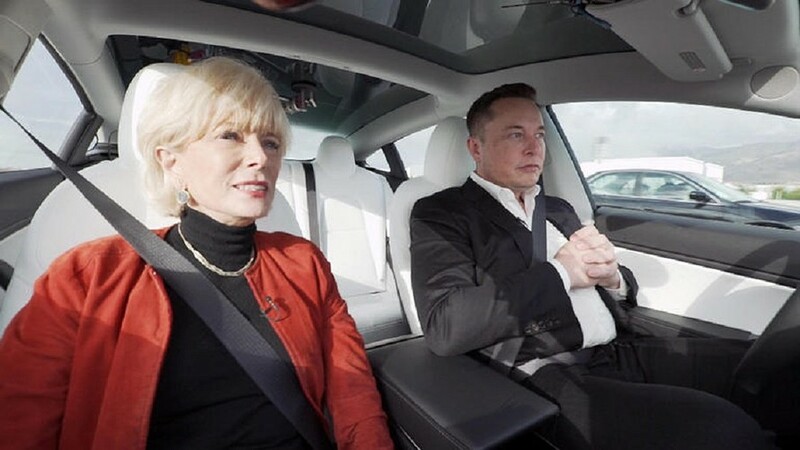 Every time Elon demonstrates AutoPilot for a news program, he does NOT hold the steering wheel while driving on AutoPilot. Well, it may be that this article overstates the case by saying Tesla says you should keep your hands on the wheel at all times. I don’t think Tesla has ever said that. What Tesla says is that you should maintain control and be ready to take over from Autopilot at any time the traffic situation warrants it. Tesla released an advanced self-driving demo two years ago where the “driver” keeps his hands in his lap at all times. His hands are quite near the steering wheel, and he’s not holding anything in either hand, so he’s ready to grab the wheel at any moment. But he’s not actually touching the steering wheel at all, for several minutes in a row. Now, it is true that several months back, Telsa increased the frequency of “tests” to see if someone is holding the wheel, so I don’t think you can actually leave your hands in your lap for as long as the video linked below shows. But that’s still a long way from “You must keep your hands on the wheel at all times”. As soon as we don’t say something related to keeping your hands on the wheel, I get to deal with an entire day of being viciously attacked by terrible comments and emails. I’d rather be safe than sorry. Suggesting that people be extra careful is a much better idea than saying the opposite. It is officially called “Autosteer”. It is not self-driving, you are still driving the car, except how you drive is significantly different. Instead of making lane and speed corrections, you focus on the road ahead and the larger picture. You must always be alert for any objects in the road or possible cross traffic pulling out, traffic signals, stop signs, etc. Personally I find this mode of driving to be much less mentally taxing, but it still requires active engagement. Stopped watching after he said you should take your hands off the wheel and feet away from the pedals. Dangerous messaging and incorrect. Driver should always be ready to take countrol with hands on the wheel and ready to brake or accelerate. Tesla should yank this guys access to Autopilot. Tesla should figure out which car is in use and disable autopilot until he calls into the Service Center and they have a reckoning. If you need to be at all time attentive and holding the wheel why the heck do I need an autopilot for !! (and on top of that pay for it !!! :-(). Now a system that can drive the car in traffic jams at speeds up to say 50 km/h that really really is a great addition. But then I need to be able not to hold the steering wheel neither to watch in front of the car, just go about my things like if I was in a train or commercial liner. For the times when you change your radio station, heater, AC, fan et… When perhaps you have had a little to much to drink and shouldn’t be driving but you did. For the times when you did not sleep a good 8 hours a day and have worked a 12-16 hour shift and then have to drive home at night, maybe in the snow or rain. perhaps you are in your 70’s and still able to drive but want added security of having your car be able to see 360 around itself. Maybe you are one of those world’s worst drivers but are still able to have a license. Just a few suggestions to think about. OK I could understand that. If I may ask, did you write this out of your own experience with autopilot or just like “think out of the box” ? I get it. I’ve had an EV for a year, and I haven’t used Auto-park yet. “I can handle this one. Next time, for sure.” Still getting used to Adaptive Cruise Control. It is video like those that are giving people the false impression which will only increase accident rates because they misuse the AP. Yup. Tesla doesn’t have any control over what is posted to YouTube, but they should issue a strong disclaimer disapproving of videos showing Autopilot / Autosteer being used in a dangerous way, a way which very clearly contradicts Tesla’s official warnings… the warnings displayed on screens which these idiots have to go thru to enable Autosteer, before they can perform these dangerous stunts. Tesla should put a link to that disclaimer in every press release or ad that describes Autopilot or Autosteer. I’m not sure Tesla would agree that users of Autopilot+Autosteer actually need to keep their hands on the wheel at all times, or even most of the time. In Tesla’s demo from two years ago, showing an advanced version of Autosteer, the “driver” keeps his hands in his lap near the wheel but not on it. In other words, ready to grab the wheel at all times, but not actually touching it. What users of Autosteer do need to do is stay alert and keep their eyes on the road, ready to take over from Autosteer immediately if danger looms.